Last month we celebrated the legacy of Civil Rights leader, Dr. Martin Luther King Jr., a courageous African American visionary who challenged our nation to allow all citizens, regardless of skin color, to have the opportunity to reach their potential—as promised in the U.S. Constitution. He is one of the many African Americans who persisted in spite of tremendous adversity to help secure the civil liberties we enjoy today. His story is one of many. African Americans have made important contributions to all areas of American life. And this month, Black History Month, is an annual celebration of those contributions. 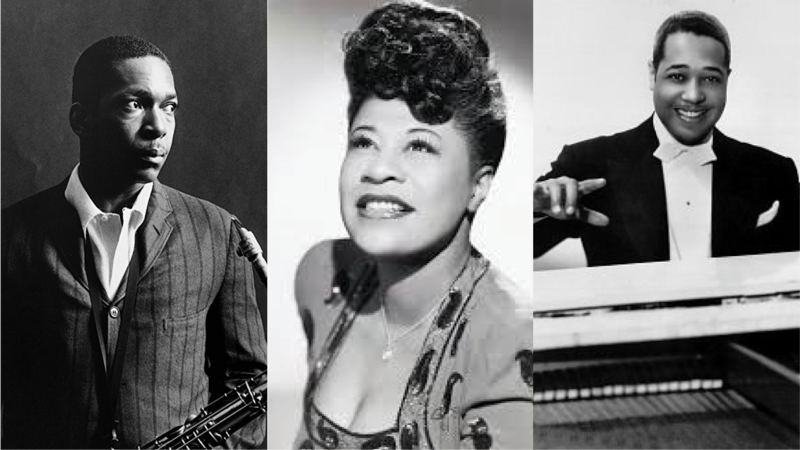 As a funder of projects that build and strengthen communities through music, today we’re turning the spotlight on three African American jazz musicians who’ve used their talents to do just that. Celebrated jazz saxophonist and composer, John Coltrane (also known as “Trane”) never described himself as a political activist, but he was an avid supporter of the Civil Rights movement. Inspired by the work of Dr. King, in 1964 Coltrane played eight benefit concerts in support of King’s work. Horrified by the 1963 16th Street church bombing in Birmingham, Ala., Coltrane was also moved to compose “Alabama”—a mournful piece that pays homage to the young girls lost in that attack and the wider social injustices that inspired the Civil Rights movement. The heartfelt piece closes with a determined, hopeful tone, bringing a renewed sense of strength to listeners. In 1961 world-renown composer, pianist and jazz orchestra bandleader Duke Ellington began to stipulate in all his contracts that he and his multicultural band wouldn’t play for segregated audiences. While some criticized his refusal to speak out more boldly against racism, he ensured his music—much of which celebrated the African American experience, like “Black, Brown & Beige” featured in the video below—made its way to audiences of all backgrounds. Today’s post opened with a quote from Dr. King referencing “triumphant music,” or music that transforms stories of life’s difficulties into celebrations of renewed hope. As we enter the second half of Black History Month, let’s celebrate the countless other African American musicians who’ve created, and continue to create, “triumphant music” to heal and strengthen our nation.